References AP_Dialog_WordCount::ConstructWindowName(), AP_Dialog_WordCount::DIALOG_WID, m_windowMain, AP_Dialog_WordCount::m_WindowName, AP_Dialog_WordCount::setCountFromActiveFrame(), XAP_Dialog::setWidgetLabel(), AP_Dialog_WordCount::updateDialogData(), and UT_ASSERT. References UT_Worker::getInstanceData(), m_bAutoUpdate_happening_now, m_bDestroy_says_stopupdating, AP_Dialog_WordCount::setCountFromActiveFrame(), AP_Dialog_WordCount::updateDialogData(), and UT_ASSERT. References AP_Dialog_WordCount::ConstructWindowName(), AP_Dialog_WordCount::localizeDialog(), m_labelCCount, m_labelCNCount, m_labelLabelCCount, m_labelLabelCNCount, m_labelLabelLCount, m_labelLabelPCount, m_labelLabelPgCount, m_labelLabelWCount, m_labelLCount, m_labelPCount, m_labelPgCount, m_labelTitle, m_labelTitleMarkupFormat, m_labelWCount, m_labelWNFCount, m_labelWNoFootnotesCount, m_windowMain, AP_Dialog_WordCount::m_WindowName, newDialogBuilder(), s_delete_clicked(), s_destroy_clicked(), and s_response(). References DELETEP, AP_Dialog_WordCount::m_answer, m_bDestroy_says_stopupdating, m_pAutoUpdateWC, m_windowMain, XAP_Dialog_Modeless::modeless_cleanup(), and UT_Timer::stop(). Referenced by event_OK(), and event_WindowDelete(). 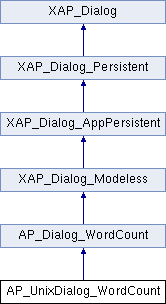 References AP_Dialog_WordCount::CHARNSP_LBL_WID, AP_Dialog_WordCount::CHARNSP_VAL_WID, AP_Dialog_WordCount::CHARSP_LBL_WID, AP_Dialog_WordCount::CHARSP_VAL_WID, AP_Dialog_WordCount::CLOSE_BTN_WID, AP_Dialog_WordCount::DIALOG_WID, AP_Dialog_WordCount::LINES_LBL_WID, AP_Dialog_WordCount::LINES_VAL_WID, m_labelCCount, m_labelCNCount, m_labelLabelCCount, m_labelLabelCNCount, m_labelLabelLCount, m_labelLabelPCount, m_labelLabelPgCount, m_labelLabelWCount, m_labelLCount, m_labelPCount, m_labelPgCount, m_labelTitle, m_labelTitleMarkupFormat, m_labelWCount, m_labelWNFCount, m_labelWNoFootnotesCount, m_windowMain, AP_Dialog_WordCount::PAGES_LBL_WID, AP_Dialog_WordCount::PAGES_VAL_WID, AP_Dialog_WordCount::PARA_LBL_WID, AP_Dialog_WordCount::PARA_VAL_WID, XAP_UnixWidget::setData(), AP_Dialog_WordCount::TITLE_LBL_WID, UT_ASSERT, UT_NOT_REACHED, AP_Dialog_WordCount::WORDS_LBL_WID, AP_Dialog_WordCount::WORDS_VAL_WID, AP_Dialog_WordCount::WORDSNF_LBL_WID, and AP_Dialog_WordCount::WORDSNF_VAL_WID. References abiSetupModelessDialog(), autoupdateWC(), constructDialog(), m_pAutoUpdateWC, m_windowMain, UT_Timer::set(), static_constructor(), AP_Dialog_WordCount::updateDialogData(), and UT_return_if_fail. Referenced by autoupdateWC(), and destroy(). Referenced by constructDialog(), and getWidget(). Referenced by destroy(), and runModeless(). Referenced by activate(), constructDialog(), destroy(), getWidget(), notifyActiveFrame(), and runModeless().